When IOR was replaced by IMS, our designer, Leif Ängermark, sat down at the drawing board and the result was Wasa 41. A fast 12.5 meter sailboat. 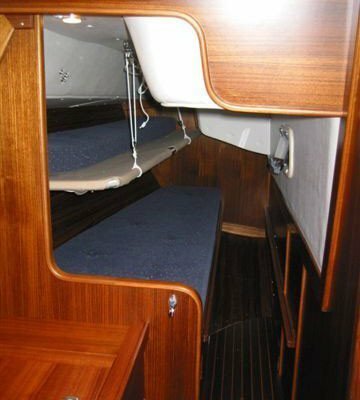 The first boat in the series was built like a a pure race boat, including a interior that was a little lighter than normal but without sacrificing quality or strength. The following boats were returned to Wasa’s traditional interior and the hull was also slightly raised to get a more spacious boat. Up to today seven boats have been built. increased slightly, as well as the width of the stern ship. Long straight lines gave the boat high speed, the low weight made it easily driven and the stern was a surfboard. (fastest of all IMS-measured Wasa boats), as also shown by another very practical measure, LYS, where her number is 1.35. With a displacement of just 6 tonnes, Wasa 41 is lightweight and lively with a lot of feeling. 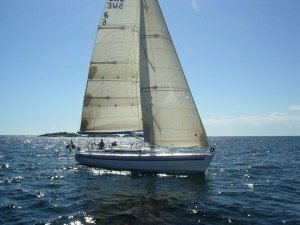 She has nice all-round features thanks to a sharp bow, moderate width in the waterline and a buoyant sternship that gives her long lines and good downwind properties. Wasa 41 has a modern, deep finkeel with only moderately inclined, slightly rounded front edge and a hint of bulb at the bottom. With a weight of about 2.7 tons, the keel gives good stiffness. Even the rudder has the modern elliptical shape, with a slight rounding even in the stern edge and tapered downward. The deck line is straight, with a low and narrow superstructure. Wide walkways extend to the very stern. In addition to the large forward hatch there are three smaller hatchs for light emitting and ventilation on the roof. 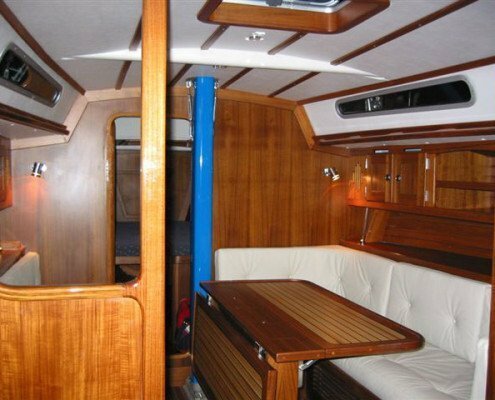 The interior of Wasa 41 is based on many years of experience from family and race sailors. This means, among other things, that the boat has good berths even when sailing. 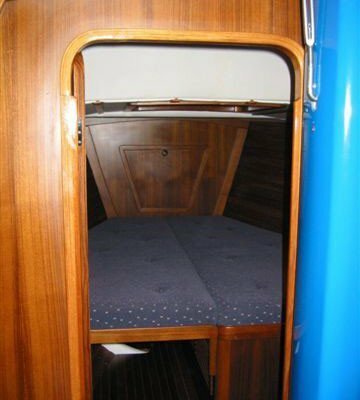 In the salon there is a pilot berth on each side, above the salon sofa. 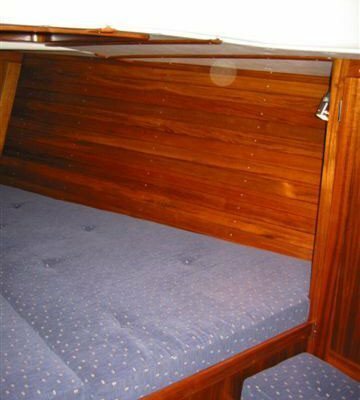 Behind the folding backrests for the sofas there is good storage for sailbags and sailclothes. Aft, under the cockpit, there are two large cabins. 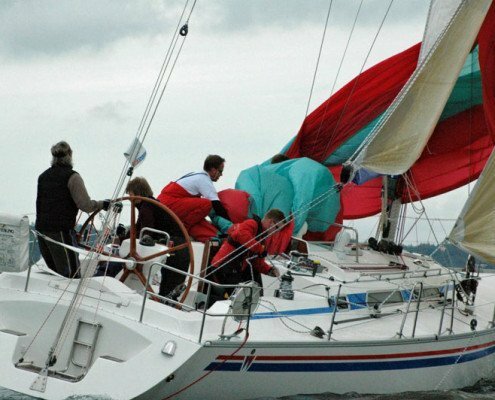 The one to port has a double berth, the one to starboard has a single berth plus a large storage space for sails and bags. 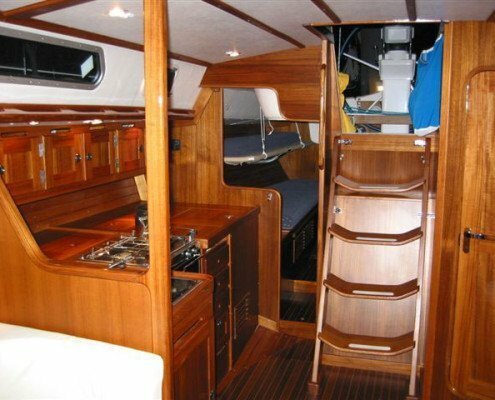 Wasa 41 is also available in a different interior design, more suited for comfortable family sailing. 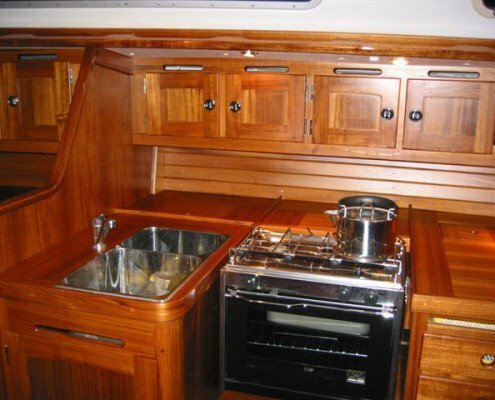 The pilot berths are replaced with cabinets and shelves and the starboard stern cabin has a double berth. In addition, the lounge sofa is replaced with a U-shaped dinette. A large L-size galley is located to the right of the entry. 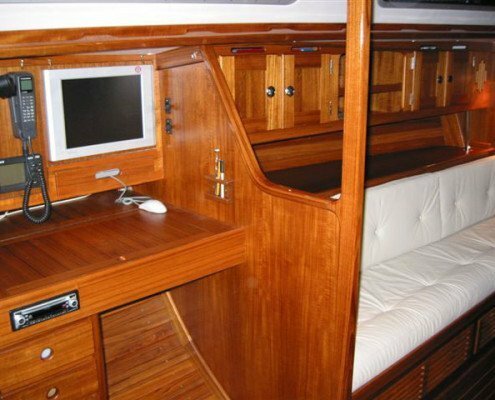 With sink and water discharge near the center line of the boat, that can be used even when the boat leans when sailing. can then be used for sail storage. Wasa IMS 41 is a 7/8-type partial rig with a slender coned mast from Seldéns. It’s very trimmable with dual straight spreaders, jumper stay, and running backstays with check stays. 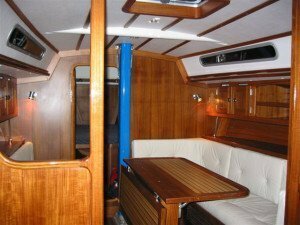 The mast is continuous and enters the boat immediately in front of the main bulkhead. The sail plane has the balancing surfaces of the fractional rig. 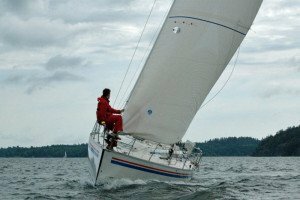 It should be easy to manage, and the boat can sail only with main sail and jib already in moderation winds. Some boats are delivered with 9/8:th rig without backstays and selftacking jib. Hull and deck are as usual a sandwich laminate with balsa as a spacer. Unlike other Wasa models, however, Twaron fibers were used to a large extent in combination with glass fiber. 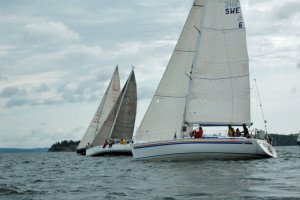 Wasa 41 is delivered with the American Certificate of Shipping (ABS) certificate, which guarantees the dimensioning, a requirement for off shore races according to category 0-2.